This Thai-Inspired Ground Turkey Larb Salad also has Sriracha, Mint, Cilantro, and Peanuts, and this delicious salad with Thai flavors can be low-carb, low-glycemic, gluten-free, and South Beach Diet friendly with approved sweetener. Use the Diet-Type Index to find more recipes like this one. 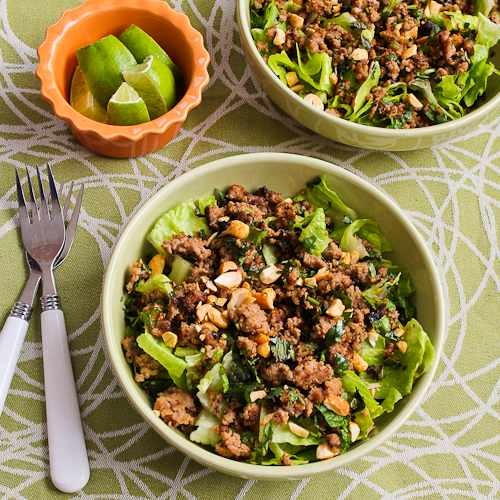 Click here to PIN Thai-Inspired Ground Turkey Larb Salad! with Sriracha, Mint, Cilantro, and Peanuts! Last Saturday about 20 Denny family relatives gathered at my house in Salt Lake and moved all my belongings to my new house in Bountiful, which is the suburb of Salt Lake where I grew up. I’ve done plenty of complaining about how hard it was to move 25 years of accumulated stuff, and I’m grateful beyond words for all the family members and friends who helped with the move, either on that day or in the weeks of packing that came before. Now all my belongings are in the new house, including 23 boxes of cookbooks! Most of my stuff is not that organized yet so there’s not much cooking going on, but luckily I made this delicious Thai-Inspired Ground Turkey Larb Salad a few weeks ago so I’d have something to share with you today. The dressing for the salad has the sweet-sour-savory-spicy flavor combination that makes Thai food so appealing and Jake and I loved this salad when we tried it. Quite a few people on Twitter and Facebook have asked for pictures of the new house, and I promise to post some kitchen photos as soon as the kitchen is presentable! However, as unusual as it is in this age of sharing every aspect of your life online, I don’t really want to post photos of every part of my new house. I hope people will understand if I choose to keep some things private and just join me in celebrating the fact that I finally have a house that’s big enough that my whole family can come for a party! This salad is loaded with flavor from minced garlic, minced shallots (or red onion), minced jalapeno, chopped cilantro, chopped mint, and a spicy dressing made from lime juice, fish sauce, sweetener of your choice, and Sriracha Sauce. The inspiring recipe for Thai Ground Pork Salad used pork, but I switched it for lean ground turkey with great results. Mix the garlic, shallot, and jalapeno into the raw turkey. Heat the peanut oil in a large frying pan, then cook the turkey over medium-high heat until it’s nicely browned, about 7-8 minutes. After the meat has cooled about 4-5 minutes, stir in the chopped mint and cilantro. (If you’re not a cilantro fan, I’d use thinly sliced green onion instead.) Turn off the heat and mix in about half the dressing mixture, stirring so it seasons all the meat. Chop romaine, wash in a salad spinner or in the sink, and spin dry or dry with paper towels. Cut up some fresh limes to squeeze on at the table, and chop some peanuts to garnish the salad. Fill a salad bowl with lettuce and top with the turkey mixture, then drizzle over a little more dressing if desired. Serve salad garnished with chopped peanuts, and with fresh limes to squeeze on at the table. This delicious salad is loaded with Thai flavors. Mix together the lime juice, fish sauce, sweetener, and Sriracha Rooster Sauce to make the dressing. Use a large spoon to mix the garlic, shallots, and jalapeno into the ground turkey. Heat the peanut oil in a large non-stick frying pan and cook turkey mixture over medium-high heat until it’s well cooked and nicely browned, about 7 minutes. Turn off heat and mix in about half the dressing mixture, tossing it with the meat so all the meat is seasoned with dressing. When the meat mixture has cooled 4-5 minutes, mix in the chopped mint and cilantro. To serve the salad, fill the bowl with lettuce and top with a generous scoop of the seasoned turkey mixture. Drizzle over a little extra dressing as desired, and top with a few tablespoons of chopped peanuts. Serve with fresh lime slices to squeeze over at the table if desired. I used my fresh-frozen lime juice for this recipe. This recipe adapted from Thai Ground Pork Salad from Food and Wine. Switching the traditional brown sugar for an approved sweetener makes this low-carb Thai-Inspired Ground Turkey Larb Salad salad a great choice for any phase of the South Beach Diet, and most other types of low-carb diet plans. Use the Diet Type Index to find more recipes suitable for a specific eating plan. You might also like to Follow Kalyn’s Kitchen on Pinterest to see all the good recipes I’m sharing there. What about very low fat ground beef (I don't do poultry)? Or ground pork? Looks yummy! I'm sure both of those would be good. Thanks Cynthia. I would probably just eat this as a whole meal, but if you want a side dish, some kind of slaw would be good, maybe Spicy Lime Coleslaw. Really any kind of salad with Asian flavors would be good. I love this recipe. What would you recommend as a side dish for it? I've made this about 5 times since discovering this recipe. It's now become a (crave-able) staple for me! Thanks! Beth, it is spelled "Larb" on Thai restaurant menus all over the U.S. and since my recipe says "Thai-inspired" I don't think there is anything wrong with how I spelled it. Thanks Carolyn. If only you did live closer, then we could cook together! Glad you like the salad. Congratulations on the successful move, Kalyn! I can just imagine the boxes piled high everywhere. Good luck with all of that! wish I lived closer and I'd come help you unpack the kitchen or something. Thanks for this larb recipe – I so rarely make Thai because of my hubby's diabetes since Thai food often contains sugar, but this recipe will work. I'll be trying it soon. Happy unpacking .. . . Thanks Zerrin. Slowly but surely I am getting a functional kitchen again. Congrats on your new house Kalyn! Hope you can easily unpack boxes and start enjoying your new kitchen! This salad sounds so tasty! Healthy and filling! Love the flavor party in it! Thanks everyone for the nice thoughts about this recipe and the new house. Hi Kalyn! I am new to your blog (and to the blogosphere). I really like your blog..the wonderful stories shared and the beautiful pictures are awesome. I need to get back into eating healthy again, and I'm so glad I found your site to add to my resource for healthy cooking. I'm so happy for you Kalyn! Your new house sounds wonderful!! Can't wait to try this salad, Kalyn. Welcome back and good to see you yesterday. Another fantastic recipe from you, Kalyn. I'm so excited for you and hope that you are settling into your new home easily. Wow Kalyn, that salad dressing sounds wonderful and low cal. I will be making soon. Becky what stops me is the idea of going back through over 1,000 old recipes to see which ones fit that category! Another yummy recipe!! I was just thinking too, you should have a paleo category as the paleo diet is so popular right now and so many of your recipes fit in that diet! good luck with your new place, it's exciting to start a new phase! Loved this recipe, I am a Sriracha-addict and a lover of laarb in all its forms. Have not done it with turkey, genius! Again, congratulations on the new house. This is a beautiful recipe. The meat-lover in me is loving how it looks, and the dieting me isn't protesting because it's turkey and it's a salad. Thanks for sharing this despite your being busy settling in. Thanks Alyssa, and I have to say, my family is the best! I love Larb and how you lightened and brightened this version up Kalyn. Congrats again on the new house – your family sounds awesome! Taya, thanks! And the cookbooks are definitely more organized than most of my stuff. Looks and sounds delicious! Welcome back and hope the move went well. I am sure you are glad that at least everything is moved in…now to organize the cook books, lol!